There’s no shortage of chocolate recipes floating around the internet, especially this week with it being Valentine’s Day and all. A more organized person who writes a food blog would’ve even planned such a thing out. I always chuckle when I get a PR pitch about my upcoming editorial calendar. This little space of the internet is about as organized as my daughters’ room. 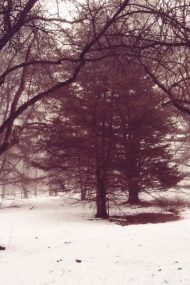 This is one place in my life where no plans are actually comforting. I can be who I want, when I want. It just so happens that my craving last week coincided with a holiday where chocolate plays so prominently. Why is that exactly? Well, you know those bittersweet brownies I shared the recipe for last week? I let out an audible gasp when I first tasted them. 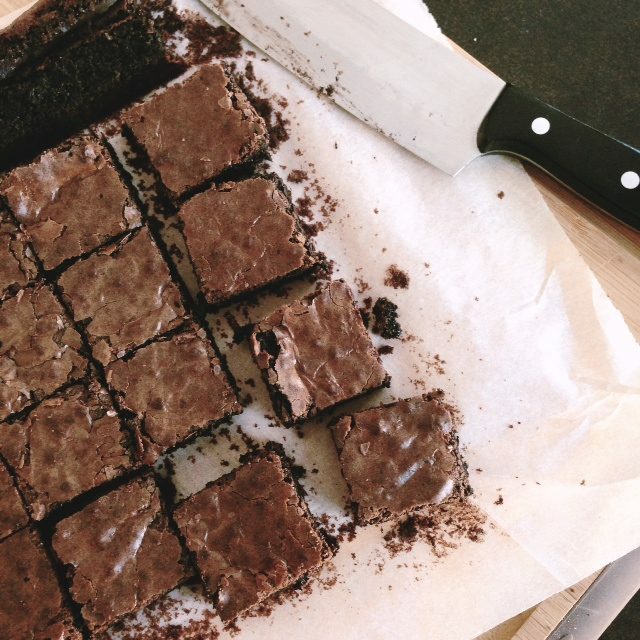 Two of my best friends, and their kids, told me they were the best brownies they’d ever eaten. Can you guess who didn’t like them? I’ll give you a clue. They share my DNA. Yes, my daughters are only milk chocolate fans. I really thought those brownies would change their mind, but it was a no-go. Thankfully I don’t rely on just their critique for all my recipes. Based on Virginia’s eating habits lately, I’d only be writing about bowl after bowl of Cheerios. It seems my once incredible eater, who loved pretty much anything, has become a fuss pot. I’m not worried, at all. But back to these brownies. These milk chocolate brownies. I was determined to make a brownie the girls would like. What I didn’t expect was to come up with a recipe that would make me moan from the first bite. If the bittersweet brownies made me gasp, well, these milk chocolate brownies and I were going to need a room, and a cold glass of milk to finish things off. 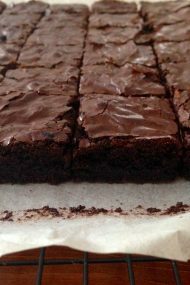 It’s taken me years, but finally, at a moment when I wasn’t even really trying, I created a homemade brownie recipe that tastes as chewy and milk chocolatey as the ones that come from a boxed mix. 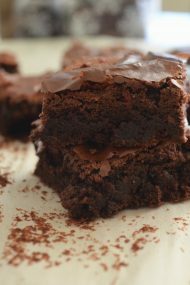 As with my bittersweet brownies, you need to exercise patience and let these cool to get to the right chewy consistency. It will be worth it, I promise, although Alex’s idea of topping them with ice cream to speed up the cooling process is very tempting. Pour the batter into the prepared pan, spreading it evenly to the sides. You can give the pan a tap on the counter to help it settle, too. Bake for 30 minutes until the center is set and the edges gently pull slightly away from the sides of the pan. Let cool completely before cutting. The last paragraph of this post made me genuinely laugh out loud, and the music pairing is perfect. I cannot wait to make these (even though I don’t love milk chocolate). These look and sound sooo delicious! My boyfriend and I don’t celebrate Valentine’s Day, but that sure as heck doesn’t mean that we can’t make some dang-good brownies!!! Jen these look absolutely delish and I am not a milk chocolate fan. But I found myself mooning over these since reading them. Every food article is so beautifully written your blog is my favorite night time routine. Ur writing is effortless and so spontaneous. Hope u have a wonderful week. This were gorgeous – the children and I made them on Saturday evening, resisting eating them (much) while still warm, and they were absolutely fabulous for dessert on Sunday, with ice-cream. Milk chocolate works really well, and the added salt makes a big difference too. 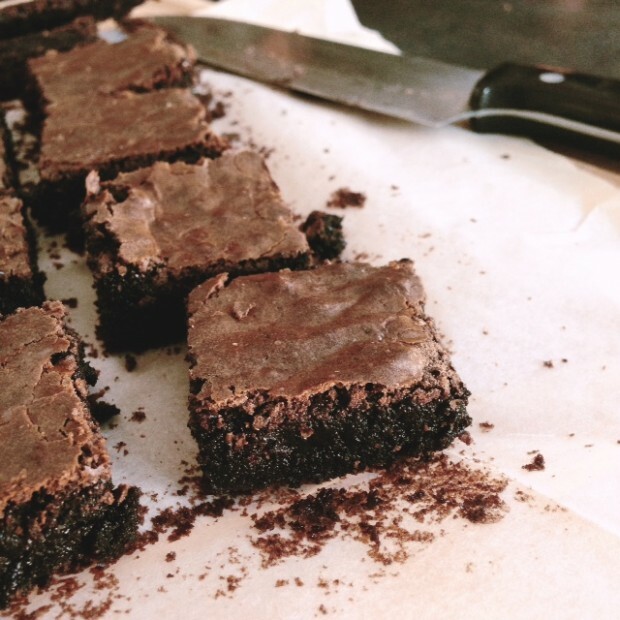 Thanks for sharing this recipe – I’ve never had great success with brownies until now. These were absolutely amazing. Definitely my go to recipe now. Thanks for sharing! These turned out perfectly! Thank you so much. Quick question: would using granulated sugar instead of cane sugar make a huge difference? JP’s Note: white sugar shouldn’t make a huge difference Rachel. I was wondering if I could use all purpose flour instead? Would there be a drastic difference? You can use an equal amount of all-purpose flour with no problem. Enjoy!